The 25th anniversary of Rawls's "Political Liberalism"
This symposium offers five essays to commemorate the 25th anniversary of the first publication of John Rawls's Political Liberalism. The authors consider how an ideal theory such as Rawls's can address historical injustices, how full autonomy is possible for citizens of the well-ordered society, how and whether Kantian elements still figure in Political Liberalism, and how Rawls's commitment to democracy qualifies his liberalism. Abstract: Liberal political philosophers have underestimated the philosophical relevance of historical injustice. For some groups, injustices from the past — particularly surrounding race, ethnicity, or religion — are a source of entrenched social inequality decades or even hundreds of years later. Rawls does not advocate the importance of redressing historical injustice, yet political liberalism needs a principle of historical redress. Rawls’s principle of fair equality of opportunity, which is designed to prevent the leveraging of class privilege, could be paired with a supporting principle of historical redress that would contend with partiality and bias in open access to positions. Abstract: Rawls says in Political Liberalism that “the focus of an overlapping consensus is [more likely to be] a class of liberal conceptions” than a single one. In conceding that members of the well-ordered society are unlikely to live up to justice as fairness, Rawls would seem to have conceded that they are also unlikely to live autonomously. This is exactly the conclusion some commentators have drawn. I contend that the likelihood of “reasonable pluralism about justice” does not have the implication for Rawls’s project that it is said to have: political autonomy remains available even when such pluralism obtains. Abstract: This article suggests a Kantian reading of Rawls’s Political Liberalism. As much as Rawls distanced himself from a presentation of his theory in terms of a comprehensive Kantian moral doctrine, we ought to read it as a noncomprehensive Kantian moral-political theory. According to the latter approach, the liberal conception of justice is compatible with a plurality of comprehensive doctrines as long as they share the independently defined and grounded essentials of that conception of justice — that is, as long as they are “reasonable,” to use the term that does most of the Kantian work. Abstract: As we read his work, John Rawls was developing an innovative approach to political philosophy, and Political Liberalism struggles with different ways to model these new insights. This article presents four models of political liberalism, particularly focusing on understanding the nature of overlapping consensus and its relation to public reason. Beyond clarifying Rawls’s insights, we aim to spur readers to reassemble the rich elements of Political Liberalism to produce tractable and enlightening models of political life among free and equal citizens under conditions of deep diversity to advance the public reason project. Abstract: This article offers a critique of John Rawls’s great work, Political Liberalism, from a non-Rawlsian liberal standpoint. It argues that Rawlsian political liberalism is influenced as much by a comprehensive view I call “radical-democracy” as by comprehensive liberal views. This can be seen in Rawls’s account of some of political liberalism’s fundamental ideas — notably the idea of society as a fair system of cooperation, the “liberal” principle of legitimacy, and the idea of public reason. I further argue that Rawls’s impressive attempt to unify liberal and democratic traditions philosophically obscures the prudent liberal attitude to democracy, which remains sound. "...was das uns Deutsche wieder kostet"? Ist das die Antwort auf den französischen Präsidenten? An English translation: "How much will the Germans have to pay?". A French translation: "Ce fascinant Monsieur Macron", L'OBS, October 26, 2017. "The fact that someone like Macron would get elected in a country whose population has always been more skeptical of the European Union than Luxembourg and Belgium, more skeptical than Germany, Italy, Spain and Portugal, was simply not likely. "The second factor separating Macron from other political figures is his break with a silent consensus. There has long been an unspoken assumption in the political classes that the concept of a Europe for Citizens is much too complex - and the final goal of European unity is vastly too complicated - to allow the citizens themselves to become involved. And that the day-to-day business of Brussels politics is only for experts and for the rather well-informed lobbyists, while the heads of state and government resolve the more serious conflicts that arise out of conflicting national interests among themselves, usually through deferral or preclusion. More than anything, though, political parties agree that European issues are to be carefully avoided in national elections, unless, of course, domestic problems can be blamed on Brussels bureaucrats. But now, Macron wants to do away with this mauvaise foi. He already broke one taboo by placing the reform of the European Union at the heart of his election campaign and rode that message, only one year after Brexit - against "the sad passions of Europe," as he said - to victory. That fact lends credibility to the oft-uttered trope about democracy being the essence of the European project, at least when Macron says it. I am not in a position to evaluate the implementation of the political reforms he has planned for France. We will have to wait and see if he is able to fulfill the "social-liberal" promise, that difficult balance between social justice and economic productivity. As a leftist, I'm no "Macronist," if there is such a thing. But the way he speaks about Europe makes a difference. He calls for understanding for the founding fathers, who established Europe without citizen input because, he says, they belonged to an enlightened avantgarde. But he now wants to transform the elite project into a citizens' project and is proposing reasonable steps toward democratic self-empowerment of European citizens against the national governments who stand in each other's way in the European Council." As such, he isn't just demanding the introduction of a universal electoral law for the EU, but also the creation of transnational party lists. That, after all, would fuel the growth of a European party system, without which the European Parliament will never become a place where societal interests, reaching across national borders, are collectively identified and addressed." "Dass jemand wie Macron in einem Land, dessen Bevölkerung seit je euroskeptischer war als Luxemburger und Belgier, als Deutsche, Italiener, Spanier und Portugiesen, zum Präsidenten gewählt werden könnte, war schlechthin unwahrscheinlich. "Der zweite Umstand, durch den Macron sich von anderen Figuren unterscheidet, ist der Bruch mit einem stillschweigenden Konsens. In der politischen Klasse verstand es sich bis jetzt von selbst, dass das Europa der Bürger ein viel zu komplexes Gebilde ist und dass die finalité, das Ziel der europäischen Einigung, eine viel zu komplizierte Frage ist, als dass man die Bürger selbst damit befassen dürfte. Die laufenden Geschäfte der Brüsseler Politik sind nur etwas für Experten und allenfalls für die gut informierten Lobbyisten; während die Regierungschefs die ernsteren Konflikte zwischen aufeinanderstoßenden nationalen Interessen unter sich, in der Regel durch Aufschieben oder Ausklammern, beilegen. Vor allem aber besteht zwischen den politischen Parteien Einverständnis darüber, dass in nationalen Wahlen europäische Themen tunlichst zu vermeiden sind, es sei denn, dass sich die hausgemachten Probleme auf die Schultern Brüsseler Bürokraten abschieben lassen. Und nun will Macron mit dieser mauvaise foi aufräumen. Er hat ein Tabu bereits damit gebrochen, dass er die Reform Europas in den Mittelpunkt seiner Kampagne gerückt und diese Offensive, ein Jahr nach dem Brexit, gegen „die traurigen Leidenschaften“ Europas sogar gewonnen hat. Dieser Umstand verleiht dem oft gehörten Satz, dass die Demokratie das Wesen des europäischen Projektes sei, in seinem Munde Glaubwürdigkeit. Die Umsetzung seiner angekündigten politischen Reformen in Frankreich kann ich nicht beurteilen. Es wird sich zeigen müssen, ob er das „sozialliberale“ Versprechen, die schwierige Balance zwischen sozialer Gerechtigkeit und wirtschaftlicher Produktivität einzuhalten, einlöst. Als Linker bin ich kein „Macronist“, wenn es so etwas gibt. Aber wie er über Europa spricht, macht einen Unterschied. Er wirbt um Verständnis für die Gründungsväter, die Europa ohne die Bevölkerung erschaffen hätten, weil sie einer aufgeklärten Avantgarde angehörten; er selbst will aber nun aus dem Elite- ein Bürgerprojekt machen und fordert naheliegende Schritte zur demokratischen Selbstermächtigung der europäischen Bürger gegen die nationalen Regierungen, die sich im Europäischen Rat gegenseitig blockieren. So fordert er für die Europawahlen nicht nur ein allgemeines Wahlrecht, sondern auch eine Kandidatenaufstellung nach länderübergreifenden Parteilisten. Das befördert nämlich die Ausbildung eines europäischen Parteiensystems, ohne das aus dem Straßburger Parlament kein Ort werden kann, wo gesellschaftliche Interessen über die Grenzen der jeweils eigenen Nation hinweg verallgemeinert und zur Geltunggebracht werden können." See also my post on the discussion between Jürgen Habermas, Emmanuel Macron, and Sigmar Gabriel on "Which future for Europe?" in Berlin in March 2017. See also my links to reviews of the German edition of the biography here and here. 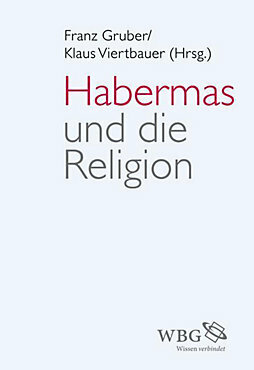 Neues Buch: "Habermas und die Religion"